LADIES, Come Sing With Us!! If you like to sing, this is your invitation to come and sing with Covered Bridge Harmony Chorus on stage for our annual Christmas Show!! 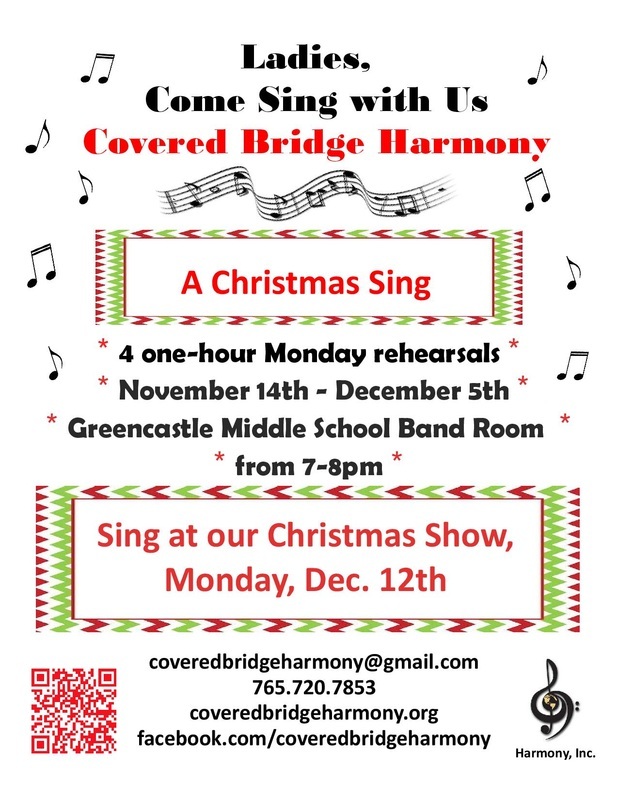 Join us for 4 one-hour Monday rehearsals from November 14th - December 5th and sing at our annual Christmas Show on Monday, December 12th. During the four one-hour rehearsals, you will have the opportunity to meet us, learn and rehearse a couple of Christmas songs, and sing along with us in four-part harmony. Stay a little longer and you can hear us prepare, rehearse, and see what life as Covered Bridge Harmony is all about. Continue to come back week after week, and you'll be invited to join us for this year's Christmas Show on Monday, December 12th. Join us on the risers during rehearsals to experience the music, friendship and fun for which Covered Bridge Harmony Chorus is known! Women of all ages are invited to attend. For more information, contact Jodi at joellenleach@gmail.com. If you're a woman who loves to sing, we'd love to meet you! Our members travel from all over the community to sing with Covered Bridge Harmony Chorus. You will come for the singing, but you'll return for the fun, friendship, and songs. Come check us out and find out for yourself!